You are here: Home / Engineering & Construction/Building Products & Materials / Ontic Engineering & Manufacturing, Inc.
Ontic Engineering & Manufacturing, Inc. is the leading provider of aerospace products & components through licensing relationships with aerospace OEMs, including: Hamilton Sundstrand, Goodrich, Woodward, Eaton, Moog, HR Textron and Parker Hannifin. Ontic's shareholders desired to consider its strategic alternatives to generate shareholder liquidity, including a sale. 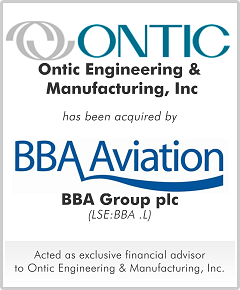 Initially, M&A Capital recommended that Ontic pursue certain business opportunities and strengthen management prior to entering a sale process, which Ontic did. After achieving certain objectives over a few years, M&A Capital targeted a broad universe of financial and strategic investors and generated numerous proposals including: growth capital, leveraged recapitalization, both minority and control capital from financial buyers and purchase offers from strategic buyers. Ontic's shareholders sold the company to BBA, as the price was attractive and BBA indicated a commitment to Ontic's business plan and management.